It is almost a pardonable offense, when people think rap is synonymous to hip hop. Not too many people can actually tell the difference . There is a huge difference between the two and I believe if we could all understand that, much of the confusion going on about whether hip hop is good or bad, would be solved. I am not trying to say I am the repository of knowledge when it comes to this, but I would humbly say it is an area I have read and learnt much about. Hence the itchy anxiety I felt when I wanted to embark on this literary journey. Rap is basically a form of poetry. Rap is oral poetry, with a fusion of rhythm and timing. Rap is a form of art. I am not struggling to define rap anyway, I am just saying the definition encompasses all these things that I have said. In my Oral Literature class, I learnt how oral poetry originated from Africa, hence, it is believed rap must have originated from Africa too. Therefore some people have come up with a somewhat coined acronym for RAP. They say it stands for Rhythmic African Poetry *shrugs*. You see, in those days, Africans recited these oral pieces in basically every daily activity. Some of which included hunting, farming, games played by children and even war. The rhythmic poetry was added to these things to eject boredom from those activities and also to boost their morale where needed. However, no one can deny the artistic value of rap. It is enormously endowed with artistic features. Whether or not rap is poetry, is no longer a subject of discussion for me. Because it is so obvious that i think anyone who disagrees might have done so as a result of prejudice. Hip hop is different. Hip hop is deeper than a genre of music. It is more of a culture and it has developed into a religion over the years. Now before you devour me like a starved lion would do, I suggest you do a little research to get your facts right. The originator of an entity has every right to define it as he pleases. No matter how much you might disagree with it, your view doesn’t matter. So for us to understand what hip hop really is, we would have to first understand the definition the founding fathers give to it. And these founding fathers include Africa Bambaata and KRS-ONE (Knowledge Reigns Supreme Over Nearly Everyone). Initially they meant hip hop to be a way of life – a culture. And embedded in this way of life is various forms of art which include break dancing, graffiti drawing and Rap. So rap is a subsidiary of hip hop. Nevertheless hip hop is not the originator of rap. In my readings, I realize that as off 2006, hip hop is recognized as a registered religion in the US. 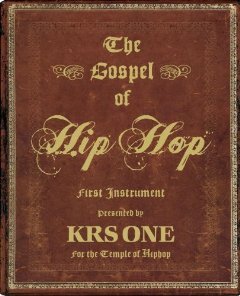 No matter how unbelievable this may sound, it becomes easily believable once you set your eyes on the book in the picture above -THE GOSPEL OF HIP HOP. So as KRS-ONE defines it, hip hop is a religion and there is no arguing about the matter because he is one of the originators of hip hop. And he wrote the Gospel of Hip Hop. My mouth remained open when I found out there is such an establishment as the TEMPLE of HIP HOP and KRS-ONE preaches the gospel of hip hop there once every month. If you are still in doubt concerning what I am saying, please go check it out on youtube, KRS-ONE preaching from the hip hop bible. I believe art is a form of language, hence the various art forms. Therefore there are people who understand the language of certain artistic forms and do not understand others. So in your bid to communicate artistically with people, you would have to find out which art form appeals to them. I say this in relation to the advent of what should be called GOSPEL RAP. There are people around the world who are inclined to rap music, therefore may find hymns extremely boring. In order to preach the word of God to such people, it is paramount we do that through a language they will understand- RAP. The problem is therefore not with the concept of GOSPEL RAP MUSIC, the problem is with the fact that people refer to it as CHRISTIAN HIP HOP. WHAT???? From the above made assertion concerning the fact that hip hop is now a religion, putting the word ‘Christian’ next to ‘hip hop’ in describing a single entity could pass for one of the most contradicting expressions ever recorded in history. It is just like saying ‘ISLAMIC BUDHISM’. This name should not be encouraged at all, as it might spell controversy in the future when hip hop becomes a fully grown religion. Maybe now we may not see the significance of discouraging the use of the term, but in the near future we will have to do a lot of explaining to cater for the confusion that may arise from this. There is no problem preaching the word of God through various mediums. The only thing is we would have to be extremely cautious not to fuse the word of God with any other world view. We need not allow any culture that contradicts that which the bible stipulates to seep into the church. Therefore I think in our bid to reach out to people, we would have to be careful not to welcome worldliness into the church.